From Our Hearts: Incredible staff, incredible food. From their displays at the start of the event to their clean up at the end, Dalton’s always get’s it right. Having them out at our venue is always a win for us and the bride and groom. How They Stand Out: We are a full service catering company, locally owned and operated since 1975. We offer complete wedding packages which are affordable and easy to understand, where the wedding party will not rent linens, plates, silverware, glassware, etc, it’s all included! My professional staff with perform all set-up, display and complete clean up. We have an OLCC liquor license and liquor liability insurance and will allow our brides and grooms to purchase their own alcohol, which is a big savings for wedding packages. 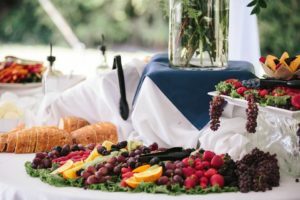 From Their Hearts: We have always appreciated the opportunity to cater wedding receptions at the terrific Water Oasis and feel that they offer one of the best wedding reception locations in the area. The layout is perfect for summer weddings with plenty of convenient parking, a wedding location with water features and a great facility under your tent for the reception all with services close and convenient. The Water Oasis is our first referral for brides in the Newberg area. What a Deal! : We provide free consultation and wedding tastings at our Tigard offices.